Can I wash my CONNI Floor Mat in a machine? If you have a top loader you can wash it in the machine on a very gentle cycle but do not spin it dry in the machine. For best results wash your CONNI Floor Mat it in the laundry sink with some laundry detergent, rinse well and hang to dry. Your CONNI floor mat can also be hosed down outside. I’ve noticed discolouration on my CONNI Bed Pad/Undergarment, can I use bleach? Please do not use chlorine based bleach or fabric softeners on any of your CONNI products. These chemicals will coat and fill the hi-tech fibres and make your CONNI product lose function. We find oxygen based bleach (such as Napisan), or vinegar works great for freshening up the CONNI range. I have a parent in Aged Care and am finding the CONNI Bed Pad just isn’t lasting? CONNI Bed Pads have a maximum washing and drying temperature of 80°C. It is possible that the temperature may be exceeding this, or that unsuitable chemicals are being used (such as fabric softeners or chlorine based bleach). Please speak with the facility about their laundry procedures. How long will my CONNI product last? There are many variables depending on usage so it is hard to say exactly how long your CONNI product will last. In general, CONNI Bed and Chair Pads should last up to 350 washes if washed in a domestic washing machine and ensuring the care instructions are followed. Undergarments typically last as long as a normal pair (6 months to a year), which is dependent on the wash and care of the garments. Do I need to use extra protection with my CONNI undergarment? No, all CONNI Undergarments they are waterproof and absorbent on their own, however, the adult liners are a great option for those who need a little extra protection during the day or night to stay dry. How much will my CONNI undergarment hold? The CONNI Undergarment range is designed for those with Light Bladder Leakage (LBL). This is often called stress incontinence and this can happen when you laugh, cough, sneeze or exercise. As everyone is different and many will have different interpretations of what LBL is, please speak with your healthcare professional to discuss if this kind of underwear is right for you. The CONNI undergarments are so thin, what are they made from?! Because of the technology we use, we are able to make our undergarments very slim and lightweight. They are made to look and feel like regular underwear. The outer layer is a cotton and elastane. There is a soft microfibre liner, an absorbent polyester interior and a supple polyurethane laminate waterproof layer which is not only breathable but will remain cool and comfortable. Is the absorbency only in the crotch of the CONNI undergarment? All CONNI undergarments, apart from the Ladies Active, have an absorbent and waterproof lining from the front of the waist, all the way up to the back. Of course! All CONNI products are reusable. This makes all of our products cost effective and environmentally friendly. Is there anything I can use to help me and my child during toilet training? As well as our Tackers being a great aid during toilet training, our CONNI Toilet Training Kit contains a bright and colourful CONNI poster, smiley stickers, CONNI Kids achievement certificate, tips and advice for parents. When is it a good idea to use the CONNI Containment Swim Shorts? The CONNI Containment Swim Shorts are designed to contain bladder and bowel matter, providing increased reassurance and confidence in the water. These are a great option for individuals wanting to go to public pools, the beach or classes like hydrotherapy. We have both adults and kids ranges. Whether you are an adult wanting peace of mind or extra protection, or a parent looking for a stylish and environmentally friendly alternative to disposable swim nappies, we have you covered! Can I use additional protection with the CONNI Containment Swim Shorts i.e. a disposable liner or nappy? You sure can. Although our design will hold any accidents, if an individual is wanting that extra protection you can certainly use it. We do recommend exiting the water and cleaning up as soon as an accident happens to ensure there are no leaks. What if I am between sizes for the CONNI Containment Swim Shorts? No worries! The adjustable drawstring and toggle are not only on the waist, they are also on both legs for extra protection to seal at all openings. Is there anything else in the CONNI Containment Swim Short? How do they contain everything? CONNI Swim Shorts are made from neoprene (wetsuit material), however they also have a built in waterproof membrane to delay void-causing germs from leaking into the water. CONNI Swim Shorts also have a built in comfort brief and feature an adjustable drawstring with toggle at the waist and legs for a secure fit. What if I have an accident whilst wearing my CONNI Containment Swim Shorts? Whilst the CONNI Swim Shorts will fully contain any bladder and bowel matter, we do not recommend prolonged wear after an accident has occurred. For good hygiene we recommend making your way to the nearest change room and cleaning up. How do I wash my CONNI Containment Swim Shorts? Hand wash in cold or warm water after each use at a maximum wash temp of 40°C. Line or air dry. Do not iron, tumble dry or dry clean. Do not use fabric softener or bleach. How do they CONNI Bed Pads work? CONNI Bed Pads are made up of a four layer system. All of these layers are laminated together to create an intimate bond which means no bubbling of the surface over time. Comfort Layer: made from brushed polyester, with special quilting this soft layer ensures optimal comfort and reduces the risk of pressure ulcers and other conditions. The surface layer is comfortable and gentle to the skin. Filter Layer: this layer is designed to allow fluid to be quickly absorbed. Absorbent Layer: this layer traps and stores the fluid. It is engineered to stop the fluid coming back to the surface so that the person lying on the pad remains dry and comfortable. Barrier Layer: made from Polyurethane Laminate (PUL), this layer is waterproof, air-permeable, and will protect your mattress from any accidents. Why don’t you use cotton? Cotton holds moisture at the surface which would not be suitable for absorbent products, and would be very uncomfortable for the individual. Why don’t you have a CONNI Bed Pad for every mattress size? CONNI Bed Pads are designed to be big enough to protect your bed and keep you/your child dry as well as being easy to launder. As much as sharing is caring, if two people share a bed it’s best they don’t share a CONNI Bed Pad. So what size CONNI Bed Pad do I need for my mattress? Our standard CONNI Bed Pad is 95cm x 85cm, it has no tuck ins and is suitable for all bed sizes. Our CONNI Bed Pad with tuck-ins is 100cm x 100cm and is suitable for single or king single beds. Do I need to put a sheet over my CONNI Bed Pad? No. Simply place the bed pad (quilted side up) on top of the bottom sheet just below the pillow in the position where you will sleep on the bed and lie directly on the bed pad. Can I use an electric blanket under my CONNI Bed Pad? Although our products are 100% waterproof, please refer to our policy for use of electric blankets with bed pads. The debate about washable absorbent pads for the purpose of managing incontinence, used in conjunction with an electric blanket is one that draws many interesting comments. Some years ago it was considered safe to use an absorbent Bed Pad with an electric blanket as long as the electric blanket was covered with a waterproof sheet. Current debate rests with the fact that regardless whether there is a waterproof sheet between the Bed Pad and the electric blanket, there is still risk of fluid penetrating through to the electric blanket which could cause serious injury or even death. The risk lies with ill fitting or worn waterproof sheets which would allow fluid to pass through to the electric device. Common practice indicates that electronic devices should not be subject to fluid or moisture. Our policy is to recommend that electric blankets are not used with any CONNI Bed Pad. Alternative warming not containing liquid, such as heat bags, should be encouraged as a replacement to the electric blanket. If the user insists on using an electric blanket, we recommend that the manufacturers of the electric device should be consulted for further advice on the usage with an absorbent product. CONNI/ Galway Trading accept no responsibility for loss, damage or personal injury resulting from our products being used with an electric device. Do you have any products that would suit my car? Absolutely! We have two sizes of CONNI Chair Pads to fit anywhere you would usually sit. This includes: chairs, wheelchairs, sofas, car seats, lounges and recliners. Do CONNI Chair Pads work the same as CONNI Bed Pads? Yes. They have the same four-layer technology as the CONNI Bed Pad, they are just a smaller version that’s perfect for sitting areas. Does the CONNI Floor Mat have that pungent rubber smell? We’ve passed one around the office and can safely say there is no strong odour (as you can see, we take giving you the right answers very seriously). The surface is polypropylene carpet and the backing is nitride rubber. Is the CONNI Floor Mat absorbent? Can I use my CONNI Floor Mat in the shower? No, the CONNI Floor Mat is not designed to be flooded with water. It is however the perfect addition to step onto when exiting the shower. Should I choose the CONNI Micro Plush or the CONNI Toggle Mattress Protector? If you would like your mattress protector to be soft, absorbent and waterproof you should choose the CONNI Micro Plush. This fits on like a standard fitted sheet and can be used by itself or with additional sheets. If you have dexterity problems or just need a waterproof barrier, you should choose the CONNI Toggle Mattress Protector. They fit easily to the mattress by tightening a toggle on each corner, meaning no struggling with an elastic fitted sheet. They are not absorbent and don’t have the soft top layer, so would recommend using this under normal bedding. I’m worried an accident might run down the side of my mattress. We have you covered! Both the CONNI Toggle and Micro Plush Mattress Protectors are waterproof right down the sides to fully protect your mattress. How often do I need to wash my CONNI Mattress Protector? For bedwetting and incontinence, CONNI Mattress Protectors are best used in conjunction with an absorbent CONNI Bed Pad. Place the CONNI Bed Pad on top of your sheet, which can then be easily removed and washed as needed. If an accident makes its way onto your CONNI Mattress Protector, wash it before next use. If you prefer to wipe down the surface rather than wash the entire protector it can be used inside out with the shiny side facing up - then you can wipe it down with a mild detergent or antibacterial solution and let it air dry. If you are using the mattress or pillow protectors to keep your bedding clean and hygienic in general, just wash regularly with your other bedding. I am worried about my CONNI Floor Mat slipping. The CONNI Floor Mat is best used on wooden, lino or tiled floors. It has an anti-slip nitride rubber backing which will not slide even if there is water or soap on the floor. What are the benefits of a CONNI Floor Mat compared to my regular one? The CONNI Floor Mat is very versatile! It is perfect for any hard surface you want to be protected from fluid - it is absorbent, waterproof, anti-slip and extremely low profile which means it remains firm and flat on the floor reducing the risk of slips, trips and falls even when using a walker or mobility device. It can be used in bathrooms, toilets, under commodes, IV stands, next to the bed or in front of chairs. Customers have also found the floor mat a great addition to the family boat, at front and back doors and even under a pet’s feeding bowl! What if there’s a fault with my CONNI product? Please contact us on 1300 721 710 to discuss and we will do everything we can to resolve your issue. You have peace of mind knowing all our products have warranties under the Australian Consumer Law (ACL). My child is going to school next year and sometimes wets during the day - can the CONNI Kids undergarments be used as an alternative to disposables? While we would not recommend the CONNI Kids undergarments as a replacement to diapers, our Kids range is a great choice if your child has Light Bladder Leakage (LBL) or when your child is toilet training. We all know accidents happen, and our tackers are perfect for someone not getting to the toilet in time, waking up too late, or not emptying their bladder completely. The size I ordered is wrong, can I exchange? Absolutely! As long as you meet our Return Policy HERE. Will the CONNI Mattress Protectors fit my pillow top mattress? Our CONNI Micro Plush Mattress Protector has a 15.7in wall which means it will fit most high top mattresses. Our CONNI Toggle Mattress Protector has a 10.6in wall. Please check the height of your mattress to see if either of these will suit before purchasing. How do I launder my CONNI products? CONNI Bed Pads, Chair Pads, Undergarments, Liners, Mattress Protectors, Pillow Protectors and Pet Pads can all be washed and tumble dried in temperatures up to 80°C. Simply place any product listed above into your washing machine with similar products and a good quality detergent. All of our products will also benefit from air/line drying in the sun if that option is available. 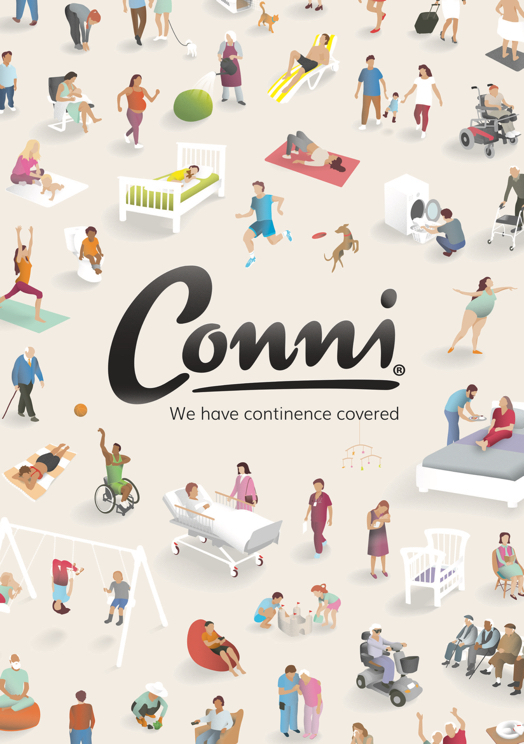 If you are a continence professional recommending incontinence aids and would like a Conni Resource Kit including product guides and mini-samples please complete the form below. Delivery Address for Resource kit. Please note: You are contacting us out of normal business hours, we will respond to your enquiry before 12pm of the next business day. Thank you. Download our Product Catalogue below.